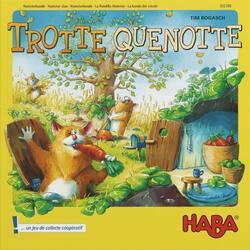 Trotte Quenotte are a bit brazen hamsters. Like crazy people, they run in their burrow. They go up and down with the elevator, unwind in the wheel, and pass from one room to another in the cabin and the wagon. But autumn has arrived and it is time to make provisions. Will hamsters be able to store all the carrots, clover and ears of wheat in the good larder before the leaves of the tree fall and cover the hedgehog?